It looks like the legendary vampire Lestat just might be returning to the big screen! Brian Grazer and Ron Howard’s Imagine Entertainment has optioned the rights to Anne Rice’s The Tale of the Body Thief, the fourth book in Rice’s best-selling series The Vampire Chronicles. The Brat Prince, Lestat, was first portrayed by Tom Cruise in 1994’s Interview With the Vampire, which was made by Warner Bros. and directed by Neil Jordan. The movie also starred Brad Pitt, Christian Slater and Kirsten Dunst. This movie was perfection, it was a brilliant adaptation. In 2002, Warner released Queen of the Damned, a big-screen adaptation of both the second and the third book in the Rice series that starred R&B singer Aaliyah. As every Rice fan knows, this was a terrible translation of the books! Warner Bros owned the rights to both The Vampire Lestat and Queen of the Damned, but those film rights had a time limit and Warner was about to run out of time, so they very quickly smashed the two together and made one terrible movie. This rushed attempt and the horrible sudden death of Aaliyah resulted in a terrible adaptation. Anyway, Imagine used its partnership with India’s Reliance Big Entertainment to fund the acquisition of Body Thief, and it is using the Imagine Reliance Writers Lab to work on the script. Lee Patterson, who wrote a well-regarded screenplay titled Snatched, is working on Body Thief. Producing with Imagine are Alex Kurtzman and Roberto Orci, the writer-producers behind TV’s Fringe and the Star Trek and the Transformers movies. Karen Kehala-Sherwood, the Imagine exec who oversees the lab, and the company’s Erica Huggins are exec producing. The project is in development and not set up at a studio. Tale of the Body Thief, the fourth in the Vampire Chronicles series finds Lestat impulsive and careless in the pursuit of what he wants: a serial killer in Southern Florida. Lestat is surrounded by mortals in this tale, a new worthy counterpoint character to Lestat is introduced, Raglan James. James offers Lestat the opportunity to switch bodies temporarily with a young mortal. Against Louis’ advice, Lestat accepts and discovers he hates everything about being human. He also finds that James has disappeared with Lestat’s powerful vampire body. Louis refuses to help Lestat become a vampire again, and he turns to another mortal to help him trick James into switching souls, and giving up Lestat’s body. 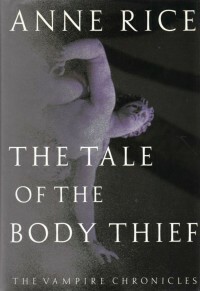 How do you feel about Rice’s The Tale of the Body Thief being made into a movie? I would love to see any Rice book on the big screen, but ONLY if it’s done very well. Body Thief may not be my favorite of The Vampire Chronicles, but if done right, I would love to see it as a movie. Interesting. Someone on goodreads actually told me about this yesterday. I’ve only read the first three books in The Vampire Chronicles, but I’m all for this movie. I am just wondering though who they will get to play Lestat. Who would you want to play Lestat and Louis? Would you want Tom Cruise and Brad Pitt to reprise their roles? I think those two are too old now. Plus, Brad Pitt has openly admitted to HATING the role of Louis, he wanted to quit during filming. So I don’t see him wanting to ever come back. I really loved the book I have read and I hope they do not ruin it. I think it’d be a good role for Taylor Kitsch. Oooh I agree! Dye that hair and get him some bright blue contacts and he would be perfect. I dont now.. I think this is a role to play Northerners.